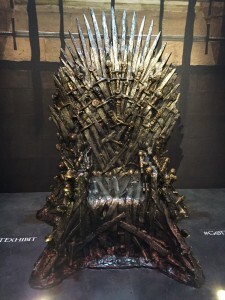 Fans who quickly signed up for the free exhibition were given the chance to see many key props and costumes from the show, as well as experience some interactive elements and photo opportunities to put them in the show. 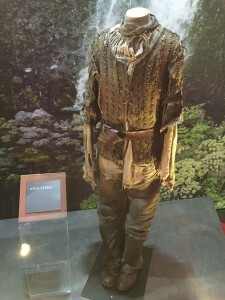 Launched by Game of Throne’s very own Samwell Tarly (John Bradley) and a group of cosplayers, the exhibition features props including dragon eggs, Jaime’s gold hand, Joffrey’s crown and The Mountain’s sword, as well as costumes worn by the major characters in the show – from Sansa and Jon to Tyrion and Daenerys. There are plaques next to each costume, but the costumes are so recognisable that these are hardly necessary. As you’d expect, there’s also the chance to take your rightful place on the Iron Throne, and visit the gift shop too. Interactivity is at the heart of the experience. Visitors have to sign up and join their house before their visit (choosing from Barratheon, Lannister, Stark or Targareon); this gives access to their own personal portal (with an introductory video from one of the cast for each house) where photos and videos taken at the exhibit were uploaded. It’s this interactivity that makes the exhibit so enjoyable. There’s a chance to film a short clip with a fire-breathing dragon, get turned into a White Walker, and – the centrepiece of the exhibit – the chance to experience what it’s like up on The Wall via an Oculus Rift virtual reality headset. This transports you from a booth at the O2, via a headset, headphones, a little breeze and cutting-edge technology, to the top of the Wall – an experience that is both exhilarating and disorientating. Like a mini-Harry Potter Studio Tour, this is a brilliant attraction for even casual fans of the show, especially considering it was free of charge. It must be said that there is quite a bit of queueing, firstly to get in and then for the photo opportunities, but care and attention has been put into the experience so it is relaxed and never feels rushed. Perhaps further down the line there will be an expanded exhibition for which they will charge, but as a free taster this is pretty special. The Game of Thrones: The Exhibition was open to Sky customers between 9-12th and 15-17th February. Game of Thrones Season 5 premieres on Sky Atlantic on Monday 13 April.